We're starting from UI in this case. Surely, we defined 'delete person' permission as like before. 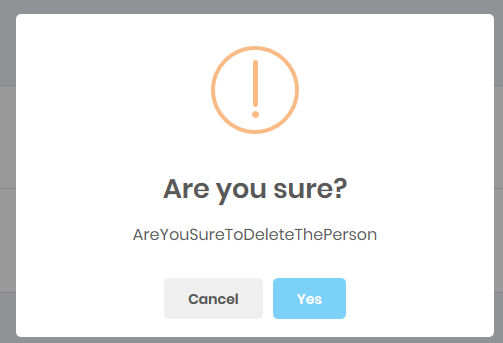 If we click Yes, it simply calls deletePerson method of PersonAppService and shows a notification if operation succeed. Also, removes the person from the page using jQuery's remove function. We also authorized deleting a person as did before for creating a person. We also need to define Pages_Tenant_PhoneBook_DeletePerson constant in AppPermissions and define related permission in AppAuthorizationProvider.